In the last few years, design — and especially interaction design — has become more methodological. There are methods for all parts of the design process. For inspiration, ideation, interpretation, sketching, composition, building, evaluation, prototyping and implementation. Students like methods because they are fairly easy to learn and provide confidence. Clients like methods because they make the design process understandable and accountable. Furthermore, as design research is becoming more and more recognised in other academic disciplines, designers need to adapt to certain ways of writing and thinking about their work. If you want to publish the design of a new visualisation in an academic context, you need to adjust to the scientific expectations of the HCI community. So it seems that design is not only becoming more methodological but also more scientific. This is not surprising. Design as a discipline has moved from “product beautification” to being a central part of product development. It has incorporated methodologies from human computer interaction, sociology, anthropology — but also from advertising and management. And with the rise of “Design Thinking”, creative methodologies were introduced to a wider range of professional disciplines. In this essay, I don’t want to criticise design methodologies. (I’ll save that for later.) But against the backdrop of a structured and methodological design process I believe it is important to remind our community that there is one fundamental aspect to design that cannot be formalised in a methodology. And that is intuition. Intuition is a difficult term. It is not a subject in design school. It’s nothing you talk about. Many designers get a bit queasy when asked about intuition. It is often associated with a impulsive, irrational decisions and aesthetic extravaganza. This is completely missing the point. Intuition has been the subject of philosophical and psychological study. But its definition varies depending on the discipline and the context. 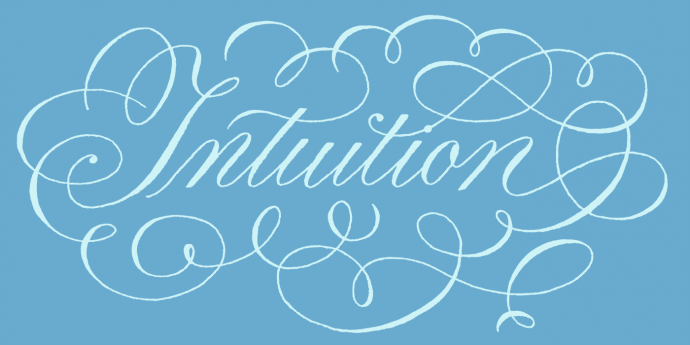 So I would like to explore what intuition means for design. Generally speaking, intuition is the ability to reach conclusions and make decisions without conscious reasoning. This is something every professional designer does on a daily basis. We know how to make social, conceptual and aesthetic decisions based on our intuition. We know how to achieve goals, solve problems and create effects. We know when something is right. This sounds quite esoteric. But it’s not. Intuition is an essential and elemental ability of designers. Intuition has a prominent role in nebulous situations. It allows us to act and to decide even if we just have little information and are dealing with unforeseen events. It enables us to handle ill-defined problems. And as most design projects are — by definition — open, vague, unclear and sometimes chaotic, intuition plays a prominent role in the process of finding the right design. If you are working in a very strict operation and if you are not dealing with any unforeseen problems, you don’t need intuition. On the assembly line, you need manual skills — but you won’t use your intuition that much. As the setting for design work is quite different from working on the assembly line, intuition has a much more prominent role. Instincts are deeply rooted in our biological self. They are behaviour patterns that are not learned or acquired. Instinctive actions are carried out in response to a clearly defined stimulus. Instinctive behaviour is characteristic in all members of a species. Design sometimes tries to evoke instinctive behaviour through a certain visual language. This can be useful for marketing and advertising purposes. But triggering instinctive behaviour in the audience has nothing to do with intuition. These are two completely different concepts. In my opinion, there is a tremendous difference between irrational and non-rational behaviour. Irrational is acting against better knowledge. Non-rational behaviour is — in the worst case — random and chaotic. Intuition can be non-rational — but it is not irrational. Compared to the natural sciences, the design world does not offer a strict system for evaluating the quality of an outcome. But design is an extremely context-dependent process. So there are are a number of possible criteria for assessing the outcome of a design process. Is a design useful? Is it technically feasible? Is it robust? Is it understood and liked by its audience or by its users? Is it successful on the market? Is it socially, economically and environmentally responsible? Is the client happy? Does it win awards? And what is the feedback from fellow designers? Depending on the specific design, more criteria can be defined. Decisions that are based on intuition should not be obscure. I strongly believe that it is important to talk about and evaluate them. For this, we have to use adequate language that reflects the process and qualities of the decision. A simple “I kind of like it” is not enough. Designers make decisions based on intuition. The decision itself may not be based on a strict rational derivation. But this does not mean that intuitive design is detached from scrutiny. Intuitive design decisions can be discussed, tested and evaluated. I am in no position to discuss the role of intuition in the sciences. But I do believe that intuition is underrepresented in epistemology. The natural sciences have a great conceptual framework and a great toolkit for testing a hypothesis. The scientific method allows for rigorous testing of new theories. Systematic observation, experiments with reproducible results and critical peer reviews make it possible to evaluate a new hypothesis. But how do scientists come up with a new hypothesis in the first place? Not every scientific idea is derived from rational arguments and analytical reasoning. There are a lot of examples for scientists who came up with a completely unfounded new theory. Furthermore, a lot of scientific problems are systematic — such as two proven theories that contradict each other. In these controversies, intuition plays a powerful role. Even in mathematics — the strictest of all sciences — intuition is recognised as a way to solve a problem. In the early twentieth century, the dutch mathematician Luitzen Egbertus Jan Brouwer developed a mathematical-philosophical theory called “Intuitionism”. Brouwer believed that intuition and time are fundamental to mathematics — and that both cannot be formalised. I am always a bit sceptical when someone describes an interface as being “intuitive”. Intuition is a purely human quality. An object or a system simply cannot be intuitive. The sentence “this software can be used intuitively” actually means that a piece of software can be understood and used by someone based on his or her intuition. Human beings — not software — are intuitive. But does intuition help us to understand and use software interfaces? This is a surprisingly tricky question. As mentioned above, intuition is helpful when you are dealing with an unclear situation, are encountering something unforeseen or are handling an ill-defined problem. So — consequently — you only need intuition if you are dealing with a bad interface. Good interfaces are actually those where you don’t need intuition in order to complete a task. The above statement may sound a bit surprising. But if a software interface is used effortlessly it is simply because it is predictable, clearly defined and based on interactions that we have learned before. We don’t need our intuition to use a book. We might need intuition in order to understand and interpret the text. But the handling of a regular book does not require intuition. In reality however, software systems are extremely complex and even good user interface designers cannot anticipate every possible condition. So users are dealing with unforeseen events and unpredictable situations and dialogues. In these cases, intuition can help the users to solve the problem. And good interface design can support the users in training their intuition. But I am sure this is not what is meant with the label “intuitive software”. Designing an usable, understandable, elegant, efficient and delightful software interface requires intuition. Using it should not. I strongly oppose the notion that intuition is a nature-given characteristic that some people are born with. Everyone has a disposition for intuition. And — most importantly — intuition can be trained, honed and cultivated. This training is an important part of design education. Students are confronted with ill-formed briefings, create designs and then get feedback on their process. More importantly, intuition is not limited to the design world. Most jobs that require some sort of decision-making are involved with intuition. Doctors, politicians, teachers — they all have their own domain-specific intuition. Some jobs require a higher degree of intuition then others. And I believe that education should reflect this. But as most teaching is based on the instruction of systematic knowledge, this can be quite a challenge. How can you teach something if there is no right and wrong — only good or poor solutions? And — as a teacher — how can you convey your feedback in a way that is not superficial and opinionated? I strongly suggest to take a look a how singing is taught on a professional level. It is really, really amazing to observe professional opera singers teach young, aspiring talents. Just watch this clip where Joyce DiDonato is teaching a Master Class at Carnegie Hall in 2016. It is intriguing how she physically and verbally critiques and reflects on both artistic expression and technique. Intuition can be trained, criticised and developed. Being a design educator, I feel very passionately about this point. In design education, we need to be more aware of teaching intuition. This part of the design education is very similar to teaching fine arts and music. As a teacher, you need to work very closely with your students and give them direct feedback on their work. Furthermore, you have to develop an appropriate language that reflects the subtleties of our discipline. Just like in art and in music, words have their own meaning and their own domain-specific context: strong, cold, balanced, discreet, contrast, noise, power, clarity, order, chaos, guidance, support, attention, (I could go on for a while) can be used to describe intuitive concepts that go beyond the direct meaning of each word. We need to cultivate this language and foster a practice of teaching intuition. In this essay, I tried to demonstrate and discuss the importance of intuition in design. I believe we should give intuition the recognition it deserves and bring it back into the centre of the design process and design education. Mainstream interaction design currently has a tendency to formalise the design process. This is not surprising as our discipline is industry oriented and aimed at designing concrete outcomes. Digital products are becoming more and more complicated. And the quality of the interaction design is becoming more and more important for the success of the product. So demanding a more formalised design process is understandable. However, I believe it is good to remember our community that not everything can be formalised. We have to live with uncertainty in the design process. And we should remind ourselves that our greatest capital is the ability to make creative, intelligent and successful decisions in unclear, contradictory and complicated circumstances. This ability is called intuition. Intuition does not necessarily lead to good design — but good design is always based on intuition. This essay was discussed with and reviewed by my esteemed next-door-colleague Prof. Dr. Frank Heidmann. Many thanks for the great discussion and the feedback! It was originally published on Medium on 6. January 2017 under the original title: “In Defence of Intuition”.